M Trivedi, S Patil. Impact of an external energy on Yersinia enterocolitica [ATCC –23715] in relation to antibiotic susceptibility and biochemical reactions: An experimental study. The Internet Journal of Alternative Medicine. 2008 Volume 6 Number 2. All living organisms contain large complex molecules within the cells. Some of these are proteins and enzymes including DNA / RNA. The nature of the organisms is dependent on the biochemical reactions, which can be characterized and identified. Antibiotic resistance, regardless of antibiotic and bacteria, will occur with sufficient time and drug use. Widespread antibiotic use causes selection pressure: resistant strains survive while susceptible ones are eliminated. Antibiotic resistance is progressive, increasing from low to intermediate to high levels . Bacterial strains are also characterized by their relative resistances to a range of antibiotics. However, such a change does not take place spontaneously in a strain over a 10-day period of normal incubation without continuous exposure to any drugs. In this paper we report the impact of spiritual energy on Yersinia enterocolitica, in revived and lyophilized state, with respect to its antibiotic susceptibility pattern along with biochemical properties analyzed within a period of 10 days. The said energy was transmitted through thought intervention of an individual, Mr. Mahendrakumar Trivedi who has been interacting with a large number of people as a healer over the last decade. As responses by humans can be accounted for by the placebo effect, these experiments on lower organisms were designed in order to directly test the impact through scientific studies to rule out the placebo effect. It is widely accepted that lyophilization is the method most commonly used to store and transport microbial cultures as change in the biochemical and enzymatic characteristics of an organism cannot be carried out in this state. Two strains of Yersinia enterocolitica [ATCC –23715] were procured from MicroBioLogics in sealed packs bearing the same ATCC number and stored according to the recommended storage protocols until needed for experiments. The study was grouped as per the following. One of the two sealed packets was handed over to Hinduja Microbiology Lab and was revived by them in two separate tubes, of which one was the control. The control tube was analyzed for identification, antibiotic susceptibility and biochemical reactions as per the standard protocols of sample processing in the microbiology lab. The second tube, (ATCC ‘A') having viable bacterial culture, was handed over to Mr.Trivedi for treatment, after sealing by parafilm. It was assessed on the 5 th and 10 th days after treatment. Mr.Trivedi held this tube in his hand under ambient conditions for between 0.5 to 3 minutes while treating it through his thought intervention process by communicating and instructing the experimental object within the tube in order to undergo the change. The tube was returned to the lab in the sealed condition itself. The second sealed packet of Yersinia enterocolitica [ATCC –23715] (ATCC ‘B') was treated by Mr. Trivedi directly in the sealed lyophilized state, using the same treatment process as above. The sealed tubes were broken and the strains were revived and analyzed on the 10 th day for identification, susceptibility testing and biochemical reactions. All tests were performed with the help of automation on the Microscan Walkaway System (Dade Behring Siemens) using NBPC-30 panels. Antimicrobial susceptibility was determined using the Minimum Inhibitory Concentration (MIC) method as per the latest CLSI guidelines. After inoculation and rehydration with a standardized suspension of organism and incubation at 35 0 c for 16 hrs, the minimum inhibitory concentration (MIC) or the qualitative susceptibility (susceptible, intermediate or resistant) was determined by observing the lowest antimicrobial concentration showing inhibition of growth. The results of susceptibility testing were expressed in millimeters of growth inhibition with disk testing and in mcg/ml in MIC testing. The acceptability of the identification media and antimicrobial agents was checked prior to the study by ATCC control organisms, S Aureus ATCC 29213, & E Coli ATCC 25922. Amikacin, Amoxycillin / k clavulanic acid, Ampicillin / Sulbactam, Ampicillin, Aztreonam, Azithromycin, Cafazolin, Cefepime, Cefotaxime, Cefotetan, Cefoxitin, Ceftazidime, Cefuroxime, Ceftriaxone, Cephalothin, Chloramphenicol, Ciprofloxacin, Gatifloxacin, Gentamicin, Imipenem,Levofloxacin, Meropenem, Moxifloxacin, Nitrofurantoin, Norfloxacin, Pip/Tazo, Piperacillin, Tetracycline, Ticarcillin / k clavulanic acid, Tobramycin and Trimethoprim / Sulfa . Glucose, Sucrose, Sorbitol, Raffinose, Rhaminose, Arabinose, Inositol, Adonitol, Melibiose, Urea, Hydrogen Sulfide, Indole, Lysine, Arginine, Ornithine, Tda, Esculin Hydrolysis, Voges – Proskauer, Citrate, Malonate, Galactosidase, Colistin, Cephalothin, Oxidase, Acetamide, Cetrimide, Nitrofurantoin, Kanamycin, Nitrate, Oxidation, P4, Tartarate And Tobramycin. Microbiology Laboratory of P.D. Hinduja National Hospital & Medical Research Centre, Mumbai, India – accredited by The College of American Pathologists. In this paper, only the changes / variations in antibiotic susceptibility and biochemical reactions that were observed before the treatment (control) and after the treatment (treated) have been reported in a tabular form attached herewith. The results of the antibiotic susceptibility tests, identification tests and biochemical tests can be seen in Table 1. Details of MIC values have been presented in Table 2. From tables 1 & 2, it can be seen that changes have occurred in both the revived and the lyophilized forms after treatment. For two of the fifteen antibiotics shown here, Ampicilllin and Cefazolin, the MIC values which were <=8 in the control strain have remained the same by the 5 th Day and then further increased to 16 in the treated sample by the 10 th day, changing the susceptibility from sensitive in the control sample to a intermediate strain in the treated sample by the 10 th day. For twelve of fifteen antibiotics shown here, Amikacin, Aztreonam, Cefepime, Cefotaxime, Cefotetan, Cefoxitin, Ceftazidime, Cefuroxime, Chloramphenicol, Gentamicin, Tetracycline and Tobramycin, the MIC values have also shown significant increase, changing the susceptibility from sensitive in the control sample to a resistant strain in the treated sample by the 10 th day . Although treated directly in the lyophilized form, a change may be noted in the susceptibility to Ampicilllin, whose MIC values increased after treatment from <=8 in the control to 16 in the treated sample, changing the susceptibility from Sensitive in the control to intermediate in the treated sample by Day 10. For Cephalothin, MIC values increased after treatment from 16 in the control to >16 in the treated sample, changing the susceptibility from intermediate in the control to resistant in the treated sample by Day 10. Table 1: Analysis of Antibiotic susceptibility patterns, Biotype Number, Organism Identification Name and Biochemical reactions of all samples. Table 2: Minimum Inhibitory Concentration values of antibiotics in mcg/ml. Biotype numbers of particular organisms were arrived at after interpreting the results of the biochemical tests. The Biotype numbers then led to the particular Organism Identification. Surprisingly, the biotypes have changed in all the treated samples and did not match with the control sample. 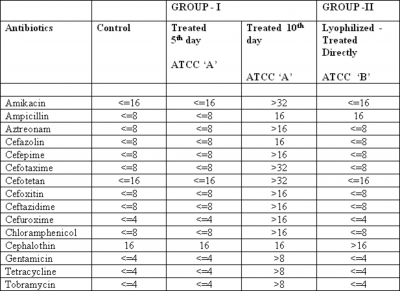 In Group I, For Indole, the reaction remained positive in the treated sample by 5 th Day as in control, but later found to have changed to negative by the 10 th day. For Inositol, the reaction was negative in the control sample and had changed to positive by Day 5 in the treated sample and later on changed to negative by 10 th day. In group I, eighteen of the biochemical reactions shown here, Raffinose, Urea, Lysine, Tda, Citrate, Colistin, Kanamycin, Rhaminose, Adonitol, Hydrogen Sulfide, Arginine, Esculin Hydrolysis, Malonate, Nitrate, Melibiose, Voges – Proskauer, Nitrofurantoin and Tobramycin, were unchanged by treated Day 5 in Group I, but later on the 10 th day were found to have changed to positive. In one of the biochemical tests, change may be noted in the Group II sample, which was treated directly in the lyophilized form. The reaction with Inositol has changed from a negative result in the control to positive by the time it was tested on the 10 th day. While misidentifications and errors in assessment of the above characteristics are known to have occurred in such tests, the existence of changes in so many properties and tests cannot be dismissed as a machine error. The findings of alterations in antibiotic susceptibility patterns as well as in several biochemical reactions as a result of the treatment applied are unexpected and unprecedented based on the literature so far, and currently unexplained by science. The biotypes of the organisms have also changed after treatment by Mr. Trivedi. This appears to indicate the presence of an energy to which the organisms were exposed. And most important is that the particular microbe reacted to this energy, which has never been reported yet. In separate studies, the effect of Mr.Trivedi's energy on bacterial strains of ATCC through DNA fingerprinting has indicated DNA polymorphism ranging from 4% to 79%  (un published). Further, 16S rDNA tests show a change in the bacterial species. . Such observations are indicative of alterations in genotype. The similarity of effect of Mr.Trivedi's unique energy on biochemical changes and susceptibility patterns of Yersinia enterocolitica [ATCC –23715] and other bacteria referenced above [2,3] lead us to postulate that Yersinia enterocolitica [ATCC –23715] has also gone through a genotype change. Thus we expect to see DNA polymorphism in these strains, which may be responsible to cause such changes in antibiotic susceptibility as well as in biochemical reactions. The results obtained in the present experiment indicate the existence of an energy that is still not known to contemporary physical and life sciences and which can effectively alter the characteristics of the microorganisms such as the bacteria studied in this work. It is not possible to find an explanation of such observations based on the current scientific knowledge. These results may give rise to better insight into the pathways that lead to mutation and may also help to understand the possible biochemical pathways that take place in the life cycle of the particular microbe. While science has so far remained unable to enter into questions regarding ‘consciousness / Spiritualism' and ordered forces or energies which can interconnect materials on a plane of higher information, the results of the current experiments prove the existence of a direct model for investigation into the impact of a spiritual energy in a rigorous manner. 1 Mr. Trivedi's energy has altered the biochemical reactions along with the antibiotic susceptibility of Yersinia enterocolitica only within the period of 10 days. 2. The changes occurred in one biochemical reaction in the lyophilized state is important as per the present knowledge and would be considered significant. 3. Lyophilization is the method most commonly used for the preservation of microorganisms, as it does not alter the Chemical and enzymatic characteristics of the microbes. On contrary, the presented results have observed the changes in few characteristics of Yersinia enterocolitica in the lyophilized state itself indicating the need for superior method for storage of particular microorganism. 4. These results cannot be explained by current theories of science, and indicate a potency in Mr.Trivedi's energy, providing a model for science to be able to investigate the impact of spiritual energy in a rigorous manner. 5. In lyophilized state, biochemical and enzymatic characteristics could be altered. The authors would like to acknowledge Ms. Nandini Altekar for helping us in writing the paper.